Apple’s (NASDAQ: AAPL) CEO Tim Cook should not pay attention to President Trump mistakenly calling him “Tim Apple.” What Cook should worry about is the whole array of problems that Apple has to deal with in the immediate future. A slowdown in China economy, the surge of China nationalism because of the trade war, forex-induced iPhone price inflation, and a longer update cycle do not paint Apple in an encouraging picture. As Apple possess one of the largest global supply chains and Foxconn/Hon Hai (OTCPK: HNHAY) is Apple’s largest supplier in China, its short-term revenue outlook should provide an early signal about the China slowdown that Tim Cook was referring to in late 2018. In addition, Foxconn’s financial provides another advantage. Based on contributor Robert Faulkner, “In Taiwan, all public companies must report monthly revenue by the 10th of the following month to MOPS (Market Observation Post System).” As Foxconn is a Taiwanese public company, it provides monthly revenue, which is not required in the U.S. The shorter horizon monthly revenue data gives investors more timely information regarding current demand on Apple’s products than Apple’s own quarterly earnings announcement. Foxconn sources more than 45% revenue from Apple as the largest supplier in China (Bloomberg Supply Chain Database). The sheer size suggests that Foxconn’s revenue growth will directly reflect the China and world demand on Apple’s products. Apple also gets more than 52% of its cost of goods sold from Foxconn. As Apple always has the most current information on its global product demand and current inventory, when Apple foresees changes, it will adjust new orders to the suppliers accordingly. Being the largest supplier, Foxconn’s monthly revenue has to be the first place to reflect such changes. 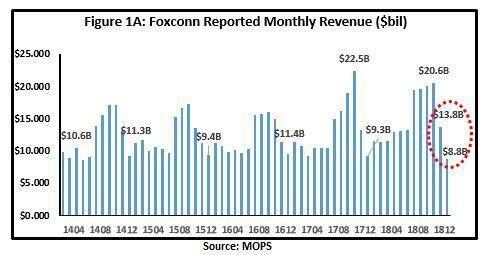 Any way you look at it, Foxconn’s revenue is bound to correlate with Apple’s revenue growth over time (Figure 1C). 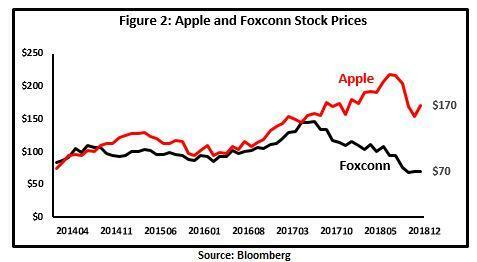 This is why Foxconn future growth is an important indicator to Apple future revenue growth. Historically, Foxconn’s January and February 2019 exhibited a similar pattern that Chinese New Year two-week holiday usually falls between January and February, though the 2019 January’s $13.8 billion and February’s $8.8 billion were lower in the same time in the last four years (circled in Figure 1A). For all fairness, a relatively slower 2019 to start for Foxconn is nothing to be alarmed for Apple. In the past, there seems to be a causal relationship from Foxconn revenue to Apple’s revenue, as Foxconn represents 52% of Apple’s cost of goods sold. The relationship may be due to the fact that Foxconn’s revenue change indicates Apple’s cost change, which reflects the world demand change for Apple’s product. In fact, whenever Foxconn revenue changed by $1 billion, it would be associated with a $4 billion revenue change (Figure 1C). As Foxconn derived 45% of its revenue from Apple (Bloomberg supply chain data), Foxconn’s stock tends to move with Apple’s stock (Figure 2), although Apple has outperformed Foxconn in recent years due to its “supercycle.” It’s more obvious for Apple than for Foxconn that both company stock prices correlate with the revenue estimates. 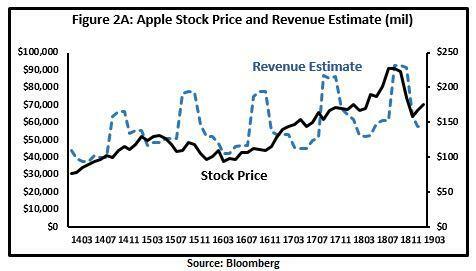 While Apple’s revenue followed new iPhone cycles, the stock generally moved with the trend but not with the cycle since it was already anticipated (Figure 2A). 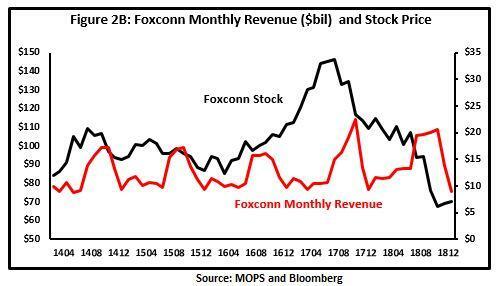 On the other hand, Foxconn stock price correlated less with its revenue estimates (Figure 2B). Being Apple’s largest supplier, Foxconn’s monthly revenue reflects more timely information about the global demand for Apple’s products. 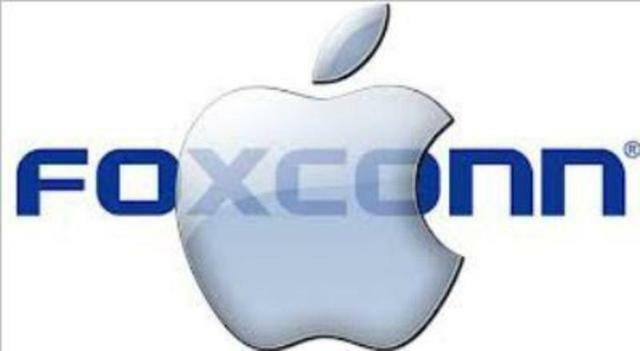 As a result, Foxconn’s revenue leads Apple’s revenue by two months. Since the two-month lead relationship is a repetitive pattern, it’s hard to justify that the pattern is not already baked into the stock price. For this reason, I correlated Apple’s stock price with Foxconn’s monthly revenue two months ago and Apple’s own current revenue estimate. The correlated relationship suggests that Apple’s stock price should currently trade around $170, assuming future revenue growth is the main driver. Given the recent run up of Apple’s price hitting near $200, it’s obviously an unpopular call that the price target should be around $170. 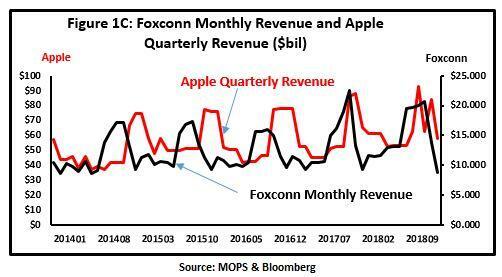 But considering that Foxconn’s monthly revenue showing little sign to be near the bottom, it would be difficult to conclude that Apple’s revenue has seen its bottom, especially since there’s a two-month lag in between. Additional disclosure: In a previous post, we mistakenly used the data from Foxconn Technology Co (2354.tw), instead of from Foxconn Technology Group (Hon Hai) (2317.tw). As a result, the previous post was withdrawn per authors’ request. The current post reflects the right company and the corresponding data that we have planned to write about. We apologize the confusion that we have caused for the readers. Thanks for your patience.